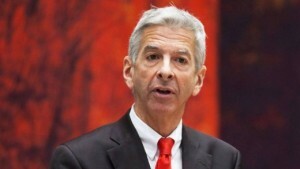 THE HAGUE – Outgoing Dutch Minister of Home Affairs and Kingdom Relations Ronald Plasterk on Friday sent a stern warning to the St. Eustatius Government: it has to abide by the law, and cannot just toss aside valid legislation and legal decisions. The decision of the Island Council last week to disregard the general WolBES and financial FinBES laws, and the recent letters of Progressive Labour Party (PLP) Councilman Clyde van Putten have confirmed for the Minister that apparently there is a belief that the Public Entity St. Eustatius does not have to stick to any Dutch laws. The adopted motion of the Island Council to which the Minister referred dictated that any provision in the WolBES and FinBES that conflicted with Statia’s right of full internal self-governance had to be ignored by the Executive Council and by civil servants in general. Plasterk stated that he “did not want to and could not” accept this suggestion. “There is no room within the Kingdom for the notion that rules and regulations can be ignored in this manner,” he stated in the letter of which copies were sent to the Statia Island Council and the Second Chamber of the Dutch Parliament.